Alila Villas Uluwatu is one of the most innovative, exciting new hotels opened in Bali in the past few years. Built on a clifftop with stunning ocean views, with beautifully decorated villas and private pools — Alila is a sensory feast of sophisticated style, atmosphere and design. Architects responsible for the Uluwatu hotel — from the Singaporean WOHA studio — created one of the smartest one of the smartest pieces of architectural design we’ve seen. The architecture of Alila Villas Uluwatu understands space, treating it in an intelligent and dynamic way. Seductive and dramatic at the same time, it sets abstract patterns of wooden verandas against tracts of monumental walls. Water is important in the architectural experience of Alila: pools of water surround buildings, pathways and stairs paved with white stone, enhancing the cooling effect of the ever-present sea breeze. Panoramic views over the Indian Ocean are complemented by visually striking pool villas, each with serene, minimalist interiors, seductive outdoor living spaces and personal butlers. The minimalism of architecture and interiors makes no apologies for not appealing to the mass-market. Alila is nothing if not self-confident. In the luxury of your own villa it’s easy to forget the hotel offers more: an excellent spa, the iconic cliff-hanging bar and a fifty-meter infinity pool, offering spectacular view over the Indian Ocean and a rugged beach, hundreds of meters below. Two restaurants flank the pool: informal Warung, with a healthy Indonesian/Balinese cuisine and elegant Cire with international menu. Alila luxury goes beyond the usual five-star standards. The experience begins even before arriving to Bali. Hotel gets in touch with guests prior to the travel with an electronic questionnaire used for personalisation of the stay. This includes everything from food preferences, the kind of experiences guests would like to have included, to the type of pillows or the preferred genre of ambient music in the bedroom. Even the butler service that can be fine-tuned to personal taste: from minimal interference to total indulgence. 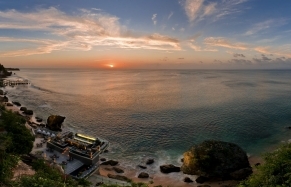 Hotel Alila Villas Uluwatu is a member of Design Hotels™. We fell in love with the sophisticated atmosphere of Alila Villas Uluwatu, its bold architecture and dramatic views from the vertiginous limestone cliff, which drops hundreds of metres to a scenic beach. We felt pampered from the beginning to the end of our stay. 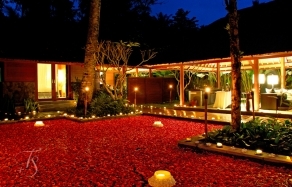 We highly recommend Alila for romantic breaks, honeymoons and other special occasions. The Uluwatu Temple is just 15 minutes by car — worth visiting for the famed sunset views and the magnificent Kecak dance performance. Just beware of the thieving monkeys! The One Bedroom Villas are built very close to each other, and their cabañas are somewhat less private.